DUABI: Burj Khalifa, the tallest skyscraper in the world, will light up with green and white spectacular LED illumination of the Pakistani national flag on Friday evening to celebrate the country’s 78th Pakistan Day. While flag hoisting ceremonies will be held at the Pakistan Embassy in Abu Dhabi and the Pakistan Consulate General in Dubai at 8.30am. Pakistan's Ambassador to the UAE Moazzam Ahmad Khan will inaugurate the event titled 'Shukriya Pakistan' in the UAE that will delight the expatriates with a four-day celebration of the Pakistan Day with a number of shows and activities. The Urdu stage play Mian, Biwi aur Wagah will be performed at the Pakistan Auditorium today from 9pm to 11pm, while stage play, games and a number of other activities have been planned for the attendees. The Urdu stage play Mian, Biwi aur Wagah was performed at the Pakistan Auditorium on Friday from 9pm to 11pm, while stage play, games and a number of other activities were also arranged to entertain the attendees. Pakistan Day commemorates the passing of Lahore Resolution, under which a separate nation for the Muslims of the British Indian empire demanded by Muslim League was passed on March 23, 1940. 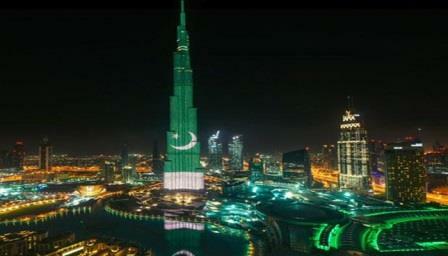 Last year, a spectacular LED illumination of Pakistan National flag on Burj Al Khalifa mesmerized people when they gathered there to watch it in the night.